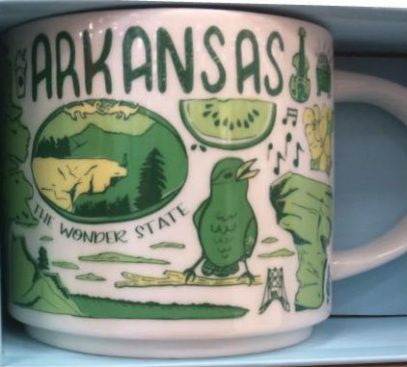 Please meet Starbucks Been There Arkansas mug. Do you know how to spell the name of this state properly or “are you confusion“? We will talk more about it soon! I was born in Arkansas. It used to be known as The Land Of Opportunity. They changed it to The Natural State years ago. As far as I know, they did not change it to The Wonder State. So….I WONDER why it says it on the Mug??? In 1923, the association persuaded the Arkansas General Assembly to adopt formally the “Wonder State” as the state’s official nickname. In 1953, the Arkansas General Assembly took note of the committee’s efforts: House Concurrent Resolution 26 explicitly jettisoned “Wonder State,” noting that it did not “command the popular appeal that it once had,” and adopted “The Land of Opportunity” as Arkansas’s new nickname, alluding to a bright outlook for the development of business, industry, and agriculture. So it looks like they’ve used an old nickname for the mug.